State Auditor Andrea Lea, whose office won the 2018 and 2019 Capitol GO! Challenges, discusses how she led her team to back-to-back victories in a new profile by our staff. 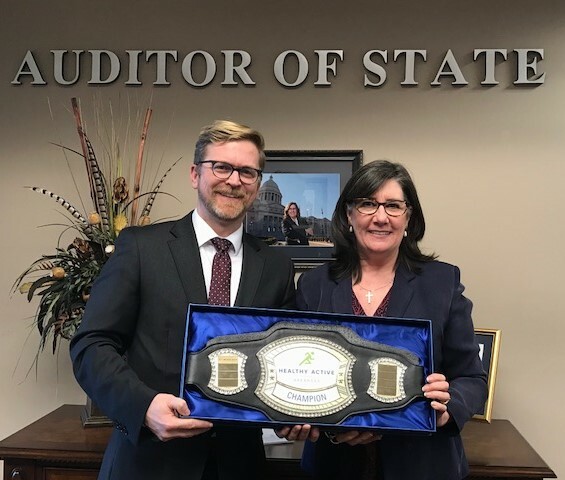 A self-described “trash talker,” Lea has been a fierce competitor in the challenge, which ACHI launched in 2017 to advance the priorities of the Health Active Arkansas initiative. The competition has consisted of steps challenges during the 2017 and 2019 regular legislative sessions and a healthy hydration challenge during the 2018 fiscal session. Lea’s team logged a daily average of 8,141 steps in the 2019 competition, which was held from Jan. 29 through March 26. Also competing were teams representing the House of Representatives, Senate, and offices of the governor, lieutenant governor, attorney general, secretary of state, auditor, and treasurer. We congratulate all 192 participants, who logged nearly 63 million steps over the eight weeks.